I have been explaining (reciting?) 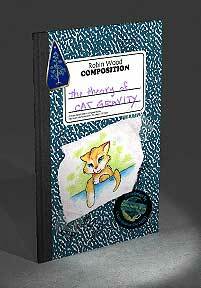 my theory of Cat Gravity at shows and festivals all over the country for many years now. And, for just as many years, the people who have been listening and laughing have been asking for it in book form. So here it is! In it, I explain just what Cats are doing in those Window Ledges, and what that has to do with being immobilized by having a Cat on your Lap, and why things pile up under your bed and on your dining room table, and why it gets harder to move the older you get, and many other puzzling things. It's all part of the same Unified Pet Theory. But wait - there's more! Since the illustrations are all black and white line drawings, you can use it as a coloring book! Paperback, print on demand. 32 pages; Illustrated by Diana Harlan Stein. Available from Amazon.com. If you would like to buy a copy, please use the link below.